It’s become way too easy to poo-poo the DC films that have come out in the last six years. They’re not very good and pretty hard to defend. Of course there have been some bright spots and her name is Diana. “Wonder Woman” is easily the best entry but finally a film has come along that is just as entertaining and visually stunning: “Aquaman.” It’s not nearly the dreadful experience as the other DC films. And to be frank, I didn’t absolutely hate any of them except for “Suicide Squad” and even that trainwreck had a few bright spots (or at least one; thank you Margot Robbie). Thankfully, this latest entry, about the water-dwelling metahuman Arthur Curry is an absolute delight from start to finish. 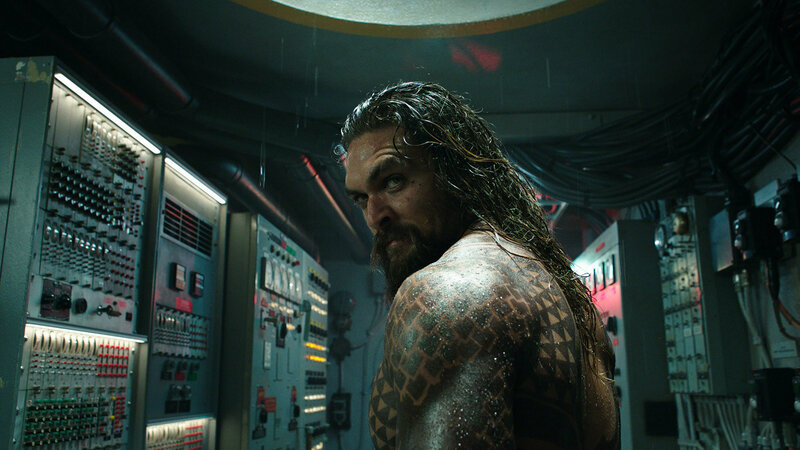 Filled with colorful, fantastic cinematography, moments of campy humor, ridiculous drama, a fun retro-infused film score, and well-choreographed action scenes, “Aquaman” easily stands out as one of the best DC films. While it’s not quite as good, this is easily the “Thor: Ragnarok” of the DC extended universe. Yes, “Aquaman” is kind of silly and that’s because the character Aquaman is kind of silly. But director James Wan makes it all work somehow. The man, who began his career making solid horror films has recently extending into bigger budget action films (like the incredible Furious Seven) proving that even with a huge budget you can make a fun, CGI-filled adventure that isn’t overwrought and stupid. Wan brings a much needed sense of color and wonder to this usually drab DC universe. While the film still has its serious moments of Shakespearean drama, the film relies more on fun visuals, humor, thrilling fight sequences and breathtaking action. David Leslie Johnson-McGoldrick and Will Bealls generally hokey and bloated script is simply an excuse to film awesome fights and action. And at this point in the world of DC I’m ok with that. And it’s mostly because it’s all staged rather well; and the actors are good enough that we somewhat care about them. There are so many positives here that this movie sort of feels like the “Citizen Kane” of the recent DC films. It’s visually wonderful – the colors, the computer generated environments are beautifully realized. The film makes me excited to see what James Cameron has in store for his underwater world in the next “Avatar” film. The computer works is actually quite remarkable. Sure some shots of characters darting across the screen like bullets are a bit silly, but generally this stuff works. Hair flows realistically underwater and the characters actually sound like they’re underwater. And considering a majority of the time they’re riding around on sharks and other sea monsters, I pretty much bought into it. In the role of Aquaman, Jason Mamoa - for all his exotic good looks - is actually quite a charming screen presence much in the same way Gal Gadot was in total control of “Wonder Woman.” Whether his sort of sidekick/love interest Amber Heard has the same presence is debatable (She doesn’t). Half the time I kept thinking Scarlett Johansson had wandered into the film from the MCU. Patrick Wilson is fine as Aquaman’s villainous half brother. And if you ever wanted to see Willem Dafoe or Dolph Lundgren ride around on sea creatures here you go. The script doesn’t quite know what to do with a secondary Power Rangers-like villain that eventually shows up named Manta (Yahya Abdul-Mateen II) but the entire Sicily sequence, most of which doesn’t take place in water, is impressively well-staged and directed. These playful side adventures were right out of Indiana Jones and were a welcomed treat in a series of film known more for doom and gloom that sheer fun. And I can’t say enough great things about Nicole Kidman who kicks utter as as Arthur’s Atlantean mother.